someone has info about the most similar pickup to the original pickup of a tunder IIa? 82´s model. 2nd generation i think. Ola, Is it for a replacement in a Thunder IIA or another guitar? I don't blame you, I'm not a fan of EMG's either. I have had good results with GFS (guitarfetish.com) Crunchy Pat's (ceramic) which make a nice replacement for MMK45's (high output with nice breakup). The 53's are similar pickups but have a somewhat sweeter/clearer tone. They too are ceramics but the magnetic field is different. I don't know what to recommend in the GFS line, unless you look at the Dream 180 perhaps??? They are nice sounding Alnico's but they may not give you the "kick" you want. I whould never have thought of guitarfetish pickups.... they build quality stuff? Anyway, for 22$, it worths a try. You recomend the crunchy pats then? wow shipping is more expensive than the pickup!!!!! The Crunchy Pats have about the same specs as the MMK45's (earlier Thunders, Spectrums, etc) But if you have MMK53's, which you appear to, you may find the Crunchy's to be too much distortion. Depends on how close you want to match the Thunder IIA sound which should be a cleaner tone. 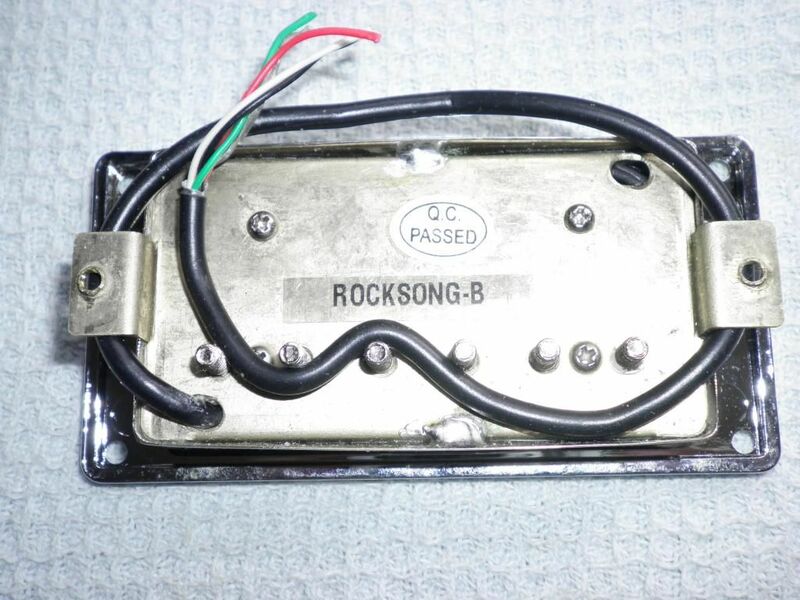 If you go to an Alnico magnet pickup the sound should be sweeter but you may not get the loudness. What guitar are you putting this in? Any of the membership have a good replacement for the '53? I exchanged some stuff i've got at home for a Cort Randy rhoads style guitar, Crunchy's "sounds" to be good enought for that guitar But the shipping fare is too high. i must look for a shared invoice. Bit more bite try this set. Nice sounding pups, but maybe on the pricey side for a casual replacement methinks. Not quite a casual replacement but a bloody good upgrade at half the price of a Duncan and just as good, seriously! The Generator set is more akin to the Duncan JB/Jazz combo. A Generator set costs £63 over this side. MMK 45/53's are going for more and are not as good as these. I like the idea of the Kwikplug on the Guitar Fetish pickups. Why doesn't that become an ISO standard and then we can all swap pups willy nilly! Adey wrote: I like the idea of the Kwikplug on the Guitar Fetish pickups. Yeah, good idea, even if it's late to the party. IIRC Mats/Aria tried something like this using what appeared to be computer type connectors. Looked very clean and neat, and of course you could swap out the pups provided the other set had a corresponding connector. Therein lay the problem of course, there were none off the shelf. You had to rig your own. Maybe it was more of an attempt to lessen manufacturing costs than offer variety? Great idea for tinkerers and repair techs though. That Tonerider gear looks pretty good, and very reasonably priced to boot! At least here in 'Straya! Can't go wrong with 'em. Which set you thinking of? I like the look/sound of the Pure Vintage set, and at A$129... why would you not? !